"The Devil... lives down there!" Daniel, a retired Chilean miner, pointed nervously towards an inky black hole. We were deep inside the bowels of a hundred year-old mine, El Chiflon del Diable - the Devil's Whistle! Perched on a hill next to the Pacific coast, I had come to Lota, a hard-pressed mining town south of Santiago, for what turned into a remarkable, and even scary, coal mine tour. It was damp, humid, muddy, slippery, and claustrophobic. Sea shells crunched under my feet, as our small group, led by our experienced guide, trudged carefully down and down and down, through the narrow, unlit, pitch black tunnels. Extending some 5km under the Gulf of Arauco, the rocky tunnels vary in depth from 200 to 1000 meters beneath the sea. Only our hat-mounted miners lamps, illuminated our dirt path. That odyssey, was one of many challenges, opening my eyes to the stunning beauty and diversity that is Chile - the Jewel of the Andes. 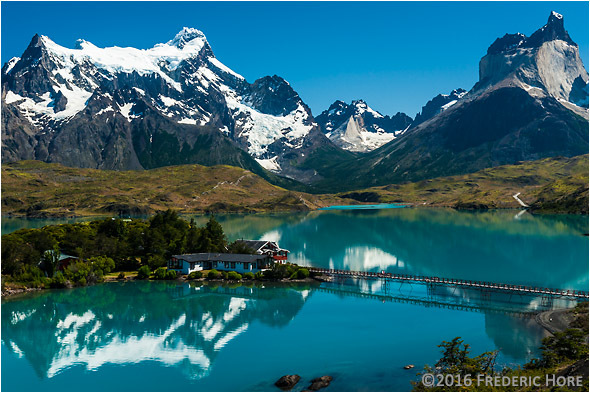 Join me for the adventure, as I take you through Patagonia's world-renowned Torre del Paine National Park, the vibrant cities of Valparaiso and Santiago, volcano climbing in Pucon, stargazing from mountaintops near Vicuna, and trekking through the desolate salt flats of the Atacama Desert. It's a vibrant and colourful 90-minute digital slide show, featuring Chilean music, infused with the history of the land, and lively travel lore. © 2017 Frederic Hore. All Rights Reserved.